Status: offline 25 year old female complains of right anterior knee pain only when descending stairs. She reports that she had an old injury 1 year ago skiing but was never evaluated for it. She denies any locking, swelling, or giving out episodes. Radiographs were ordered by the referring physician but were never read. What are the findings? 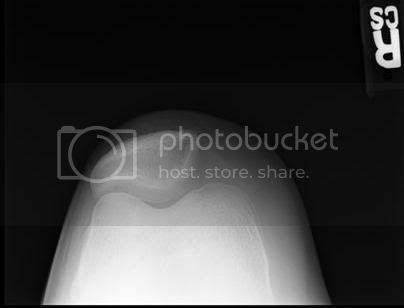 Status: offline It appears to me to be an osteochondroma or an exostosis of some kind on the posterior distal femur just proximal to the condyles. 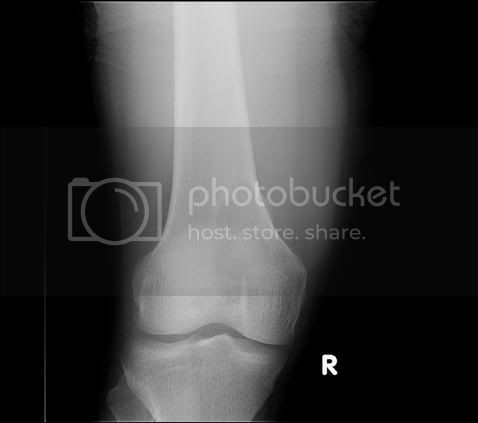 Status: offline On the sunrise view there is a divot in the articular surface of the medial condyle. Status: offline Big problem. No sense guessing when it could be a nasty tumor. Refer to orthopod who deals with musculoskeletal tumors immediately. Rehab can wait. Status: offline I agree with the tumor but I think the cause of the pain descending the stairs is the condylar defect. Looks like there's quite a bit of um...soft tissue... in the thigh area....anyone think this thing would be palpable? Status: offline This may be a tumor of some kind. Will there be any other radiologic imaging done to narrow down the choices? CT, bone scan, etc? Status: offline This may be one of those cases where you're looking for something simple and find something big on accident. That is, if it is a tumor. Would a tumor on the post aspect cause her pain? And would descending stairs trigger her pain? Maybe the condylar defect explains her symptoms. Status: offline Hello, its been a while. What were the findings from the radiographs Alex? FINDINGS: Convexity along the posterior aspect distal femur measuring approximate 6.2 x 2.4 x 2 cm consistent with an osteochondroma. There is no evidence of bony destruction, periosteal reaction or soft tissue mass. No evidence of fracture, dislocation or significant arthritic change. IMPRESSION: Osteochondroma posterior aspect distal femur. In my current physical therapy situation I am able to order radiographs and I am the first provider to view them. Even with several years of looking at these I personally always make a quick call to the radiologist on call when I see these just to be sure. We can't miss an osteosarcoma. Status: offline What has been the plan of care, if any, to address the pain with descending stairs? Status: offline From my limited experience dealing with this type of pathology, surgeons usually do not operate unless the lesion is constantly interfering with daily life/functional activities, levels of pain have increased, or if malignancy has occurred. I believe the literature suggests malignancy occurs very infrequently...something like 1-3% of the population with an osteochondroma. My numbers may be a little skewed as I cannot recall the specifics, but it's close. Status: offline Thanks for sharing Chris. I had a patient a few years ago that had a large osteochondroma on the lateral side of the knee that was interfering with the IT band. It was excised and the patient did great. JMA, this patient went through some patellofemoral rehab and is doing quite well. 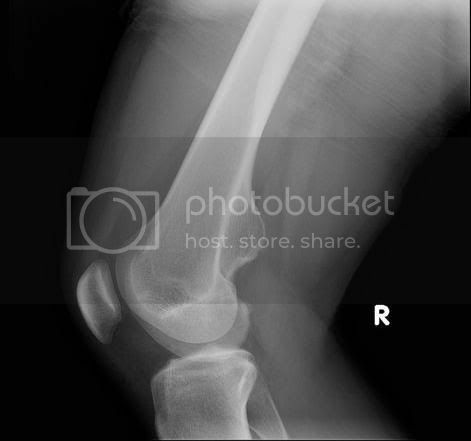 The osteochondroma was an incidental finding.